June 11, 2012 - Senators Kent Conrad and John Hoeven and Congressman Rick Berg convened a meeting with officials from Delta Airlines, Great Lakes Airlines, the United States Department of Transportation and representatives from Devils Lake and Jamestown to consider possible solutions to the ongoing flight service disruptions confronting those communities. Lt. Governor Drew Wrigley represented Gov. Jack Dalrymple and voiced similar concerns on behalf of the state in a meeting. The delegation said repeated concerns raised by officials in Devils Lake and Jamestown including an increasing number of service disruptions and high air fares spurred the need for a meeting among all parties to clear the air and generate potential solutions that would benefit all sides. “Consistent and reliable air service is critical to any community. That is particularly true in North Dakota, where the level of our economic activity and long travel distances require consistent access to air service,” the delegation and the Lt. Governor said in a joint statement. 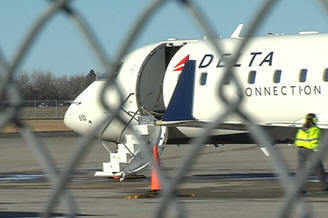 The delegation offered its support in smoothing out the transition from Delta Airlines to Great Lakes and suggested there may be additional options beyond the existing interline agreement between Great Lakes and Delta that could address the air fares from these communities to destinations beyond Minneapolis. Both Delta and Great Lakes pledged to the delegation and representatives from both Devils Lake and Jamestown to reevaluate current operating procedures and formally consider proposed solutions to alleviate some of the reliability and price competition challenges that continue to hamper service to those towns by June 15. In addition to the delegation and the Lt. Governor, the meeting included: Devils Lake Mayor Richard Johnson, Devils Lake Regional Airport Manager John Nord, Jamestown Regional Airport Authority Board Chairman Jim Boyd, Jamestown Regional Airport Manager Matthew Leitner, Great Lakes Airlines Chairman and President Doug Voss and CEO Chuck Howell, Delta Airlines Senior Vice President for Delta Connection Carriers Don Bornhorstand the Chief of Delta’s EAS Program Dennis DeVany, and the Department of Transportation’s Assistant Secretary for Aviation and International Affairs Susan Kurland.